Stass Shpanin, a 23-year-old Azerbaijani-born and Russian-speaking American artist, rediscovers his roots as his talent is nurtured at Moscow’s Surikov Art Institute. Stass Shpanin was a young boy living in Baku when he first saw a portrait by Tahir Salahov, the Azerbaijani artist, and the painting simply amazed him. When he was 15, Shpanin moved to the United States with his Russian-speaking parents. Fate, talent, and a Fulbright have led Shpanin back to his one-time idol. He is now studying under Salahov at the Surikov Art Institute in Moscow. Both student and teacher are Baku-born and Russian-speaking, and so it seems entirely natural that Shpanin should benefit from the tutelage of Salahov, also a vice-president of the Russian Academy of Arts. While in Moscow, Shpanin worked on a series of evocative pieces that draw on the dramatic story of the family of the last Russian emperor, Nicholas II. The Tsar and his family were executed by the Bolsheviks in the Ural Mountains city of Yekaterinburg in 1918. Shpanin’s paintings were recently exhibited at the Central House of Artist and Salahov expressed his delight at the American’s interest in Russian history. 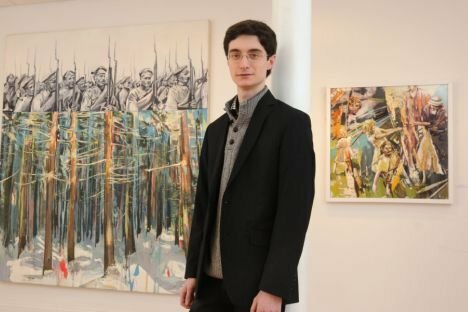 Shpanin, who in some ways resembles the actor Daniel Radcliffe, has been attending the Surikov Art Institue as an American Fulbright Scholar, the program that allows Americans to study around the world. Shpanin’s time in Moscow has also given some insight into the differences between American and Russian art education. In the majority of American art schools, he said, conceptual art is the prevailing ethos and students are expected to form and execute their own ideas. In Russia, the focus can be more academic and students are often heavily influence by the master painter they study under. Shpanin was something of a child prodigy who began to draw with his mother’s lipstick on various household objects. The talent was obvious and his parents sent him to drawing classes. Shpanin secured his first exhibition when he was seven. By the time he was 12, he sold his first works of art to a museum in Hadera, Israel — and staked his claim to a place in the Guinness Book of Records as the world’s youngest professional artist. That same year, while still living in Baku, Shpanin won top international honors in a student art contest affiliated with the Library of Congress. “He paints brilliantly hued still lifes and vivid street scenes, draws sure-handed pencil sketches and composes swirling and unsettling abstract images,” The Washington Post reported at the time. In 2007, Shpanin drew the attention of President George Bush after he painted a piece called Madonna 11th, which was a remembrance of the Sep. 11, 2001 attacks on New York and Washington, D.C.
Shpanin’s time in Moscow’s ends this fall, and he plans to return to the U.S. and work on a series about firearms. The Colt factory is located near the University of Hartford, and in the wake of the Newtown, Connecticut elementary school shooting last December the subject of guns in America is both current and controversial.